Star Wars 9 may be about to cap off a trilogy, but that doesn’t mean it can’t throw in one or two more melancholy moments to have us feeling just a little bit teary-eyed by the time we leave the theaters. 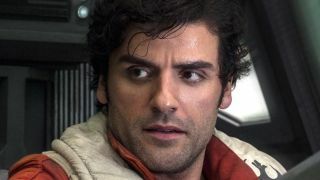 Case in point: you can count on one hand the amount of prominent members of The Resistance that remain – and Oscar Isaac (AKA Poe Dameron) is keen to hammer home their plight in a recent interview. Well that… doesn’t sound promising. The Resistance may be exceptionally low on morale as well as numbers by the time Star Wars 9 rolls around. All roads seem to be leading to Poe Dameron becoming a General and taking the reins at some point, so it seems very interesting for Isaac to make reference to that. But it appears as if he’s got some tough choices ahead in his future – and they might just make or break the Resistance’s future. No pressure, Poe. Big fan? Check out the best Star Wars T-shirts. The best Star Wars Lego deals.